Time flies, Secret Recipe is celebrating their 16th anniversary this year! 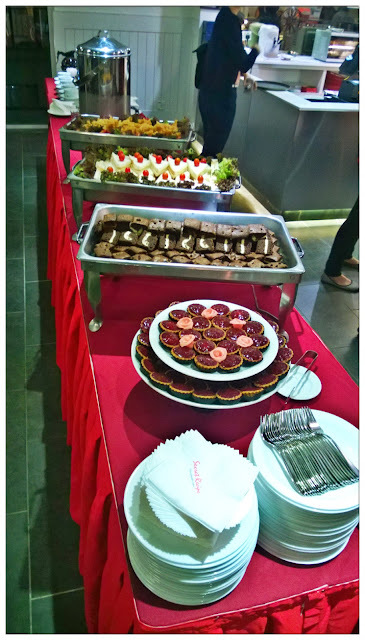 Oasis Square Ara Damansara's Secret Recipe! 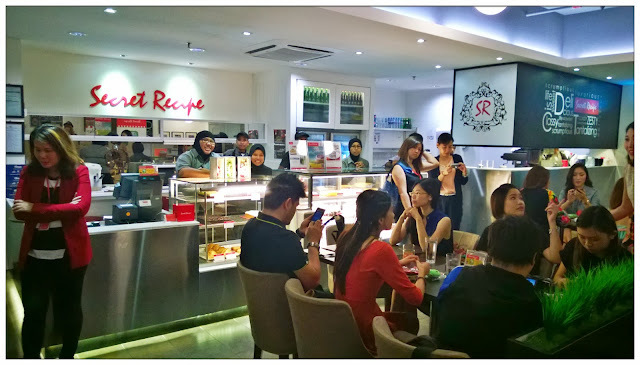 Me and lotsa bloggers were invited to Secret Recipe's Sweet 16th Anniversary celebration as well as witness the collaboration between WeChat Malaysia and Secret Recipe! Double dose of good news for both of the companies! Lotsa bloggers and familiar faces at the event. Look at them delicious foooooood!!! 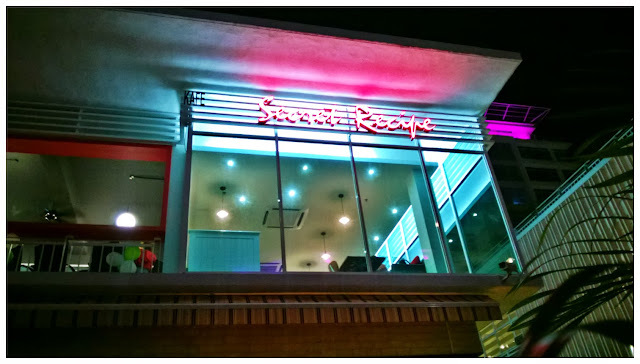 It was my first time visit Oasis Ara Damansara's branch of Secret Recipe, so it's a bit hard to find the exact location. I went to the event with Lisa, both of us were awed by the beautiful night landscape of the fountains just outside Secret Recipe's outlet. In fact, the whole area of Oasis Square Ara Damansara is pretty chillaxing and the atmosphere is just really one of a kind. Have to thanks for the event invitation, or else we wouldn't discover how pretty the location is! With HUGE WeChat plushie and small plushies. I love the super big plushie, so soft! 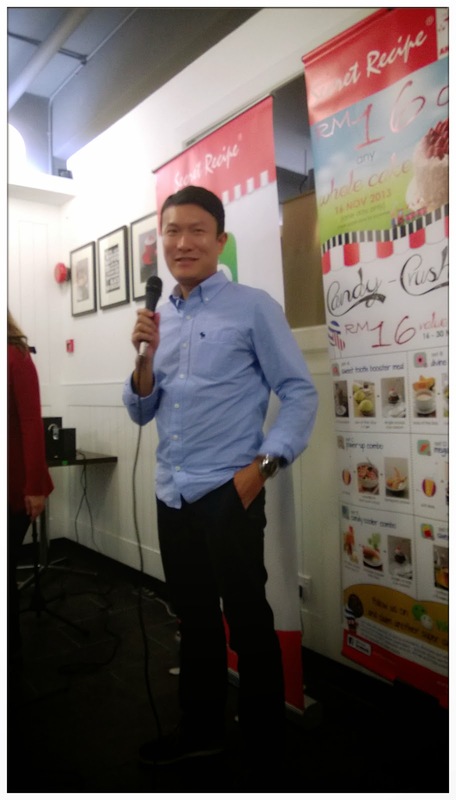 Opening speech by WeChat's Malaysia and Singapore Country Manager Mr. Louis Song. You gotta follow Secret Recipe's Official WeChat account! TADAA~! Sweet November deals for all the Secret Recipe WeChat Followers! 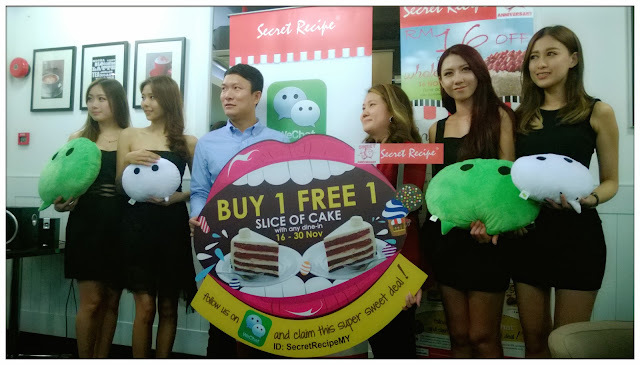 Followers of Secret Recipe WeChat account are entitled for a sweet deals this November: Buy 1 Free 1 Slice of Cake at participating Secret Recipe outlets! And Secret Recipe are having super sweet candy crushing value deals from 16th - 30th of November: RM16 for the combo meals! And it marks the start of a collaboration of two big companies! We had so much that night and I was sitting with a group of fun and playful bloggers. Although I'm quite wear out by work earlier that day, with the yummy food and desserts plus a good chitchat laughing session, I'm all boost up and feeling energetic! Plus, the mini WeChat plushies are sooooooooo cute! 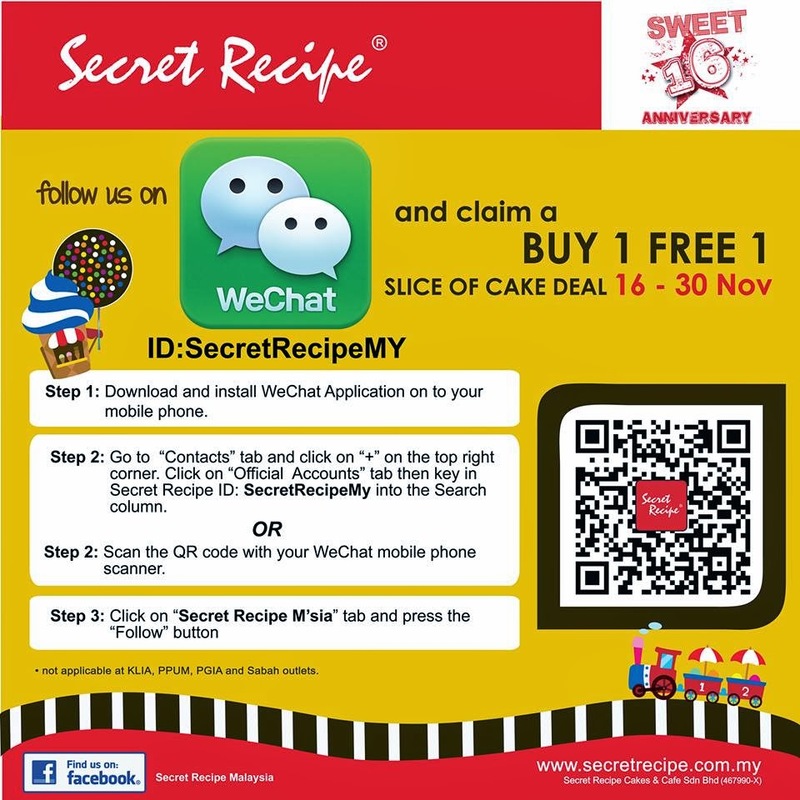 So download WeChat application on your mobile phone now and follow Secret Recipe's Official WeChat account today to claim the Buy 1 Free 1 slice of cake sweet deals. This lovely promotions are held from 16th - 30th November, so don't miss it! Happy 16th Birthday Secret Recipe!